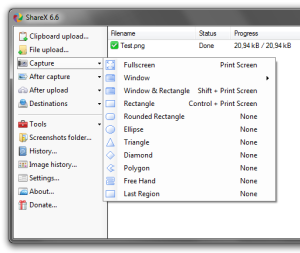 ShareX is an open source program that lets you take screenshots of any selected area with a single key, save them in your clipboard, hard disk or instantly upload them to over 30 different file hosting services. ShareX can capture screenshots with different shapes: rectangle, rounded rectangle, ellipse, triangle, diamond, polygon and also freehand. It can upload images, text files and all other different file types. It is able to capture screenshots with transparency and shadow. Capture methods: Fullscreen, Active window, Window list, Active monitor, Monitor list, Rectangle, Rectangle / Window, Rounded rectangle, Ellipse, Triangle, Diamond, Polygon, Free hand, Last region, Screen recording (Supports animated gif), Auto capture. After capture: Add image effects, Add watermark, Annotate image, Copy image to clipboard, Print image, Save image to file, Save image to file as, Copy file to clipboard, Copy file path to clipboard, Perform actions, Upload image to host. Upload methods: File upload, Clipboard upload, Drag and drop, Shell context menu, Send to from Windows Explorer, Watch folder. After upload: Use URL shortener, Post URL to social networking service, Send URL with Email, Copy URL to clipboard.